BPC has a variety of value-added parts manufacturing capabilities with additional capabilities being added each year to meet the ever changing needs of the customers. The BPC Parts Business continues to explore higher volume opportunities and long-term partnerships with their customers to provide them with a more cost-effective supply chain. 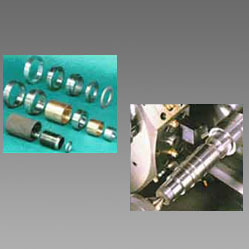 For example, CNC machined parts are now delivered Just-In-Time as to the long bar product as ordered in the past. Precision short-cut and ground shaft blanks are now being shipped in place of turned and polished long bar. Because BPC has the capability of finishing as hot-rolled bar or tube, they are in the strategic position to provide the next value-added operation. Allow the bar and tube experts at BPC to take it one step further to meet your needs.